Abdul Karim (right) listens as his ministry’s permanent secretary Hii Chang Kee makes a point in the lobby of the State Legislative Assembly (DUN) Complex yesterday. KUCHING: Sarawak achieved another milestone yesterday at the State Legislative Assembly (DUN) after all the assemblypersons from both government and the opposition sides unanimously voted in favour of establishing a Consultative Committee to determine and agree upon the representations for submission to the Sarawak representatives of the Malaysia Agreement 1963 (MA63) Steering Committee. The setting up of the Consultative Committee to comprise members from all political parties represented in the august house was moved by Minister of Tourism, Arts, Culture, Youth and Sports Datuk Abdul Karim Rahman Hamzah (PBB-Asajaya) in his ministerial motion under Standing Order 23(1)(a) read together with Standing Order 89 and Article 24(1) of the State Constitution. The Consultative Committee was proposed as a response to the formation of MA63 Steering Committee on Sept 5 chaired by Prime Minister Tun Dr Mahathir Mohamad, which was described as being lopsided because it had only three representations from Sarawak. Yesterday’s ministerial motion by Abdul Karim was seconded by Assistant Minister of Corporate Affairs Abdullah Saidol (PBB-Semop). It also saw the participation of 30 other members of the august house, which was described by DUN Speaker Datuk Amar Mohd Asfia Awang Nassar as a ‘record’. The motion was put to vote by Asfia after the debates ended, and received all-round support from all the assemblypersons with Asfia declaring the motion as unanimously approved. Following the ‘historic’ unanimous support, Abdul Karim remarked that he was proud to see members of the august house coming together to support the motion, which he believed was a historic moment, as well as something which could go through the annals of history as an important day in the history of the State Legislative Assembly of Sarawak. He said he did not expect when tabling the motion in the morning that it would later on generate a lot of interest because the other assemblypersons were only informed prior to the motion and even those nominated to the committee only knew their names were included after the motion was tabled. “Today, I can see Petra Jaya deliberating and sending signal to Putrajaya how we should approach this issue, when we want to get Malaysia to be better structured and a better place. There is no issue about Sarawak going for secession, no issue of Sarawak wanting to go for independence, or to be on our own. “I can see that we are able to speak as one voice whether we are on the government side or opposition side. Despite the little bit of ‘punches’ traded during the debates taking place whole day today (yesterday), generally I can say that all of us are united as one when the interests of Sarawak are affected,” Abdul Karim said in his winding-up speech. Earlier, when tabling the motion, Abdul Karim said this Consultative Committee is to determine and agree upon the representations for submission to the Sarawak representatives of the MA63 Committee to advance and safeguard the special interests, rights and position of Sarawak as enshrined in MA63 and the Federal Constitution and to meet the expectations of Sarawakians for greater autonomy and devolution of powers to the state. The Consultative Committee comprises Asfia as the chairman, Abdul Karim; Minister of International Trade and E-Commerce and Second Finance Minister Dato Sri Wong Soon Koh; Assistant Minister of Law, State-Federal Relations and Project Monitoring Sharifah Hasidah Sayeed Aman Ghazali; Abdullah, Assistant Minister of Youth and Sports Datuk Snowdan Lawan; Dato Idris Buang (PBB-Muara Tuang); Dato Sebastian Ting (SUPP-Piasau); Dato Henry Harry Jinep (PDP-Tasik Biru); See Chee How (PKR-Batu Lintang) and Irene Chang (DAP-Bukit Assek). 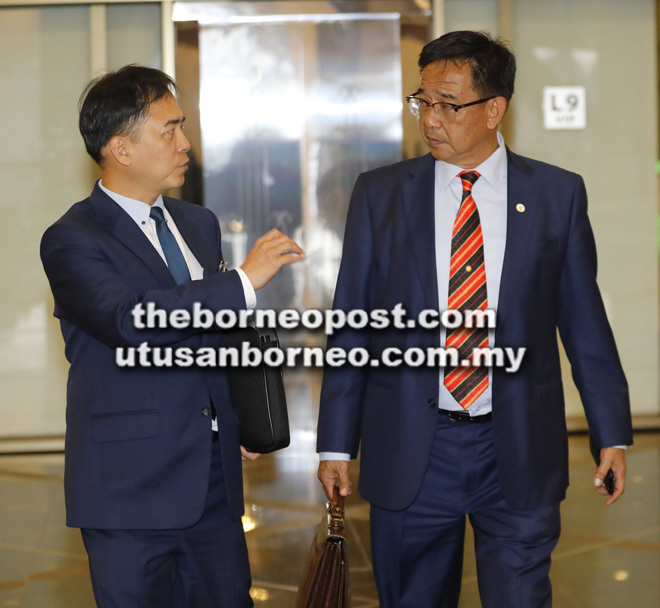 On the suggestion by Asfia to also include DUN deputy speaker Dato Gerawat Gala, Ali Biju (PKR-Krian) and Chiew Chin Sing (DAP-Tanjung Batu) in the committee, Abdul Karim said he had no objection but he would leave this matter to be deliberated further by members of the august house. Abdul Karim proposed the tenure of this committee to be up to the conclusion of the MA63 Committee review or “until this august house otherwise decides”. “I urge all members of this august house to support this motion to send the strongest message possible that in the matter of the rights and interests of Sarawakians, the people of Sarawak firmly stand as one,” he said. According to Abdul Karim, Chief Minister Datuk Patinggi Abang Johari Tun Openg had written to Dr Mahathir about the extremely lopsided composition of the MA63 Committee. He said the Chief Minister requested for a review of the composition to take into account the status of the parties as equal partners when the Federation of Malaysia was formed, and suggested that something akin to the structure of the Inter-Governmental Committee (IGC) be used as a model. “Bearing in mind, the subject matters under the purview of the MA63 Committee relate to the special rights and position of Sarawak which is very close to the heart of all Sarawakians. “It is imperative that a mechanism be put in place to ensure the views and aspirations of Sarawakians are incorporated into the representations to be submitted on behalf of the state to the MA63 Committee,” he said. He explained the honourable members of the Sarawak State Legislative Assembly are representatives of the people of Sarawak and therefore all Sarawakians would want and indeed demand their representatives put forward what is in the best interest of all Sarawakians. “This is so, irrespective of political allegiance. Consequently, it is my view that the mechanism to determine and agree upon the representations to be made to the MA63 Committee for the safeguards to the special interests and position of the state and in seeking for greater autonomy would be through the establishment of Consultative Committee under Standing Order 89 and Article 24 of the State Constitution,” he said. He further said the Consultative Committee is to be guided by terms of reference including to meet and agree upon the representations to be submitted by the Sarawak representatives to the MA63 Committee. Secondly, the Consultative Committee is to ensure that these representations are consistent with the objective of advancing and safeguarding the special interests, rights and position of Sarawak as enshrined in MA63 and the Federal Constitution, he added. And thirdly, the representations should meet the expectations of Sarawakians for greater autonomy and devolution of powers to the state.